The green field represents the rich agricultural lands and parks of the region. The blue and white band refers to the escarpment and Niagara Falls, two natural phenomena that have established this region with rich economic, topographical and historical importance. The chevrons are a reference to the locks of the Welland Canal, and they further indicate the twelve constituent municipalities amalgamated in 1970. The gold lines symbolize the various elements that contribute to the region’s wealth, based on the escarpment’s natural legacy. The Royal Crown honours the first Parliament in Ontario at Newark, now Niagara-on-the-Lake. The mural coronet indicates that these are the arms of a municipal government. It is made distinctive to the region with the addition of shells and roses, representing the emblems of the former counties of Lincoln and Welland. The river lion symbolizes the unique spirit and heritage of the region. It grasps a calumet, or native ceremonial pipe, in honour of the Neutral Nations and Iroquoian Loyalists who were the original inhabitants of the region. The falling water is a reference to Niagara Falls. 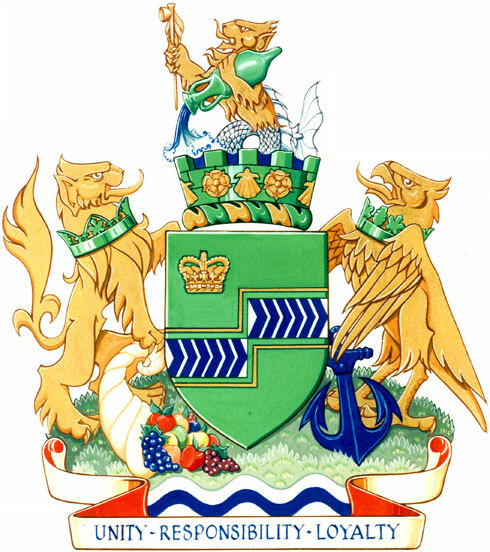 The lion and eagle are based on the personal arms of Major General Sir Isaac Brock, a hero of the Battle of Queenston Heights and the War of 1812. The Loyalist civil and military coronets worn by the lion and eagle make them distinctive to the region and recall its historical importance in the survival and development of Canada. The anchor symbolizes the shipping industry associated with its lakes. The cornucopia alludes to the agricultural wealth of the region, displaying certain products that are unique to Ontario. The supporters stand on a grassy mound representing the many sources of vegetation growing throughout the regional municipality. The three bars of blue and white symbolize the multitude of waterways and specifically the waters of Niagara, the Welland Canal, and Lakes Ontario and Erie. This motto was chosen by the 25th Anniversary Celebration Committee. “Unity” was chosen to recall the early settlers of the region who stood united with Britain during the War of 1812 and is a reference to the union of purpose to ensure a prosperous and progressive future for the municipalities and counties that comprise the regional government. “Responsibility” makes a connection to leadership and the act of governing the affairs of the Region. “Loyalty” is another reference to the tradition of loyalty to the Crown.